For many, the lifestyle they’ve grown accustomed to enjoying during their working years is also their ideal future in retirement. Sadly, many find themselves worried as retirement nears, unsure if their investments will support their long-term hopes and dreams. 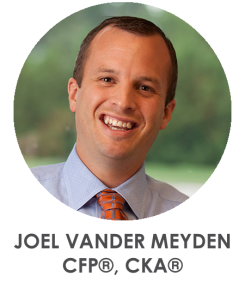 For more than 17 years, Joel Vander Meyden has been helping West-Michigan families create financial clarity so they can confidently retire to the life they desire, using FAC’s proven process. Joel is a lifelong resident of West Michigan and married to Mandy, his wife of 19 years. They are the parents of 4 children, ages 13, 11, 9, and 6. Joel and Mandy enjoy spending time at Barlow Lake throughout the summer as well as occasional trips to Lake Michigan. They also enjoy summer and fall camping, eating at local restaurants throughout West Michigan, and spending time downtown.